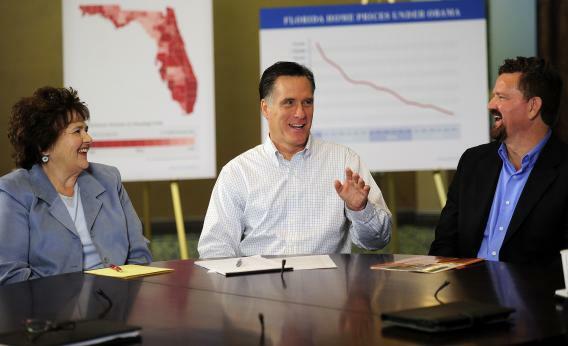 TAMPA, Fla. – Mitt Romney was underdressed. Nine struggling Tampa residents were meeting him at 8 a.m., in a circular Sheraton conference room overlooking a pool. They dressed for a meeting. He dressed in jeans. The last time I watched Romney in such a set-up, he uncorked a joke about forgetting his blazer; he left that in the bottle this time. He took a seat in front of a foreclosure map, grabbed a pen and a piece of paper, and started note-taking on individual stories of pain. “I’m breaking even,” said the Real Person. “You’re breaking even,” said the candidate, relieved. Most of the stories focused on bad banks, not bad personal decisions. Romney was adamant: People who owned homes weren’t to blame for the problem. Ah: Fannie and Freddie. It was the first oblique reference to the GSEs, one of which employed Newt Gingrich as, in his word, a “historian.” But this was as partisan as Romney got. He preferred to nod sadly at the stories and speak generically about what needed to be done; not necessarily what government should do. “Too many institutions aren’t willing to write it off and say, we made a mistake, we over-leveraged, we loaned too much,” he said. After the meeting (and after a Fox interview), Romney stood with his back to the water and took questions. (The new setting was missing something that the old setting had in abundance – sunbathers walking around in bikinis.) How did Romney square his foreclosure pain-feeling with his previous statements that foreclosures should be allowed to happen? He didn’t say he’d bail out the people.